A personal protection weapon that actually writes! 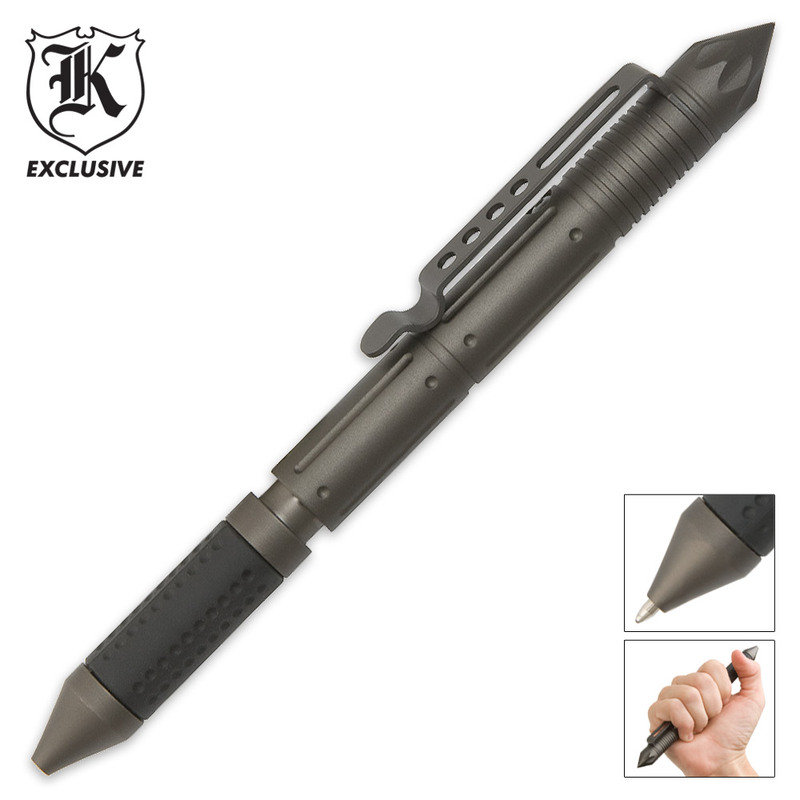 This tactical pen is constructed of 6061 aircraft aluminum and writes in black ink. It features an aggressive kubaton point. Instead of a cap, this pen has a twist closure. The etched design and pocket clip provide a secure grip for writing or defending. 6 3/4" overall. I originally grabbed this for my girlfriend, but I decided it's too large for her. She just won't carry it. Good news for me! I really like it, and carried it in my shirt pocket the first day. A retired soldier at the VA Hospital noticed it right away, and commented about it. Of course I handed it over, and he smiled as he moved it around in his hand. He asked how much, where to get it, and I'm pretty sure BudK has a new customer. If you plan on carrying this in your suit pocket, I'd think twice. It's heavy, and the DNA collector on the business end is sharp, sticks out and is obviously a weapon, at least if you might be a guy that carries a knife. About the TacPen; It's really well put together, clips strongly in your pocket, and makes a great kubaton. You get good purchase on this pen, it's grippy and strong. There's one thing I'd say about this pen, the "twist closure" isn't a mechanical retractor style pen. In order to have the ball point part of the pen hidden, I needed to unscrew the housing about 2 turns. It's okay though, the housing is equipped with a really nice o-ring to keep it secure. It won't unscrew by itself, and it stays where you put it. It works well, however differently than a "normal" pen. I wrote with it once, the girlfriend wrote with it. But that's not why I got this self-defense Tactical Pen, is it? You'll like it, it'll be hard to give it away. Grab yours now, I love it. This is a man's pen for sure! Nice heft. Feels good in the hand. Stays secure in the pants pocket. Watch out for the tip, though. Heck of sharp. Uses standard Parker Quink retractable gel refills. When I got this pen it had another tip more bullet shaped so it doesn't look quite as intimidating. Plus the pointed one. Nasty to say the least. I put a Parker refill in it. Writes perfectly. The paint is coming off where the ink pen comes out but I carry it in my pants pocket.First off, I paid 10 bucks with free shipping. The clip works very nice and tight. It is big, make no mistake. Let me say that I have searched for a smaller tactical pen for the same price and I just can't find one that I like as much as this one.So now I am very satisfied with the product. 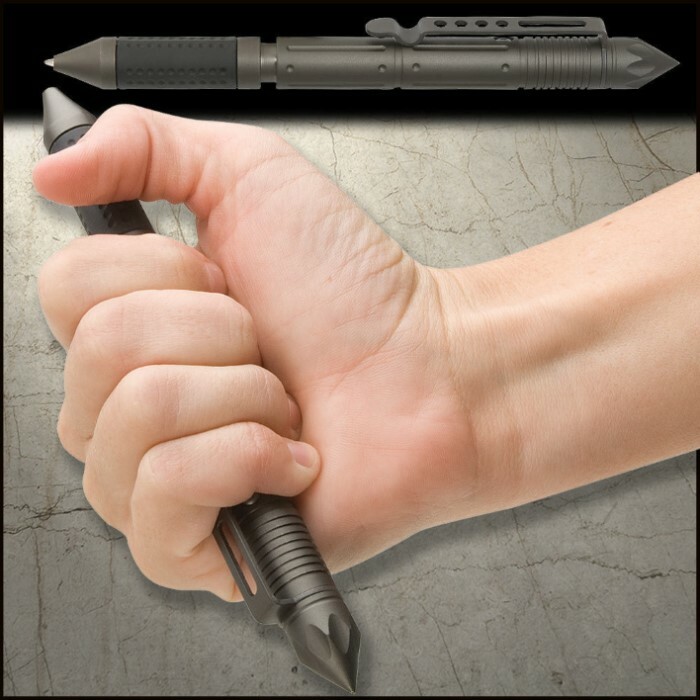 It is indestructable and trust me, this tactical pen WILL protect you without compromise. You could pay twice as much or more and not get better quality. You won't be sorry you got one. This pen is great and a great value. Makes all points for a very good tactical pen. Love these monsters. The look aggressive as you can see in the pic/video. The weight is significant. The lenght is listed in the product details. It is large. What you might not know from the descriptions is just how incredibly sharp the pointed end cap is. This is a sturdy and formidable self defense pen! This Pen's quality is OK but the size isn't practical. It's to long to fit in a uniform shirt pocket properly and if you store it in a pants pocket it pokes you if you bend down. If It were just a kubaton it would be great but as a pen for every day carry it can be cumbersome. It's not a bad product it's just not for me. Solid built. Great addition to my self defense. Useful, and I can get refills. Great to have as a back up,very sharp tip. Got 4 gave them out as gifts.And it writes too, can't beat that.